Private Thomas Alexander Mills, Royal Marine Light Infantry, Plymouth Battalion, Royal Naval Division, was killed in action on May 3, 1915, while serving at the Dardanelles. His name is recorded on the Helles Memorial, Turkey, and commemorated on the Diamond War Memorial. During the Great War, the Royal Marines were divided into two branches – Light Infantry and Artillery. Both served at sea on the ‘big’ ships (cruisers and larger) and on land. At the beginning of the War, it was decided to form a Royal Naval Division, which from 1914 to mid-1916 operated under naval command, but was then reorganised as an army division (63rd). Royal Naval Division was made up of two Naval Brigades, supplemented by one Marine Brigade – the 3rd Royal Naval Brigade (Marines), comprising 9th Battalion Portsmouth, 10th Battalion Plymouth, 11th Battalion Chatham, and 12th Battalion Deal. The old St Columb's College at Bishop Street, the scene of communal violence in 1920. The Marines Brigade was organised on traditional army lines. During February and March 1915, elements of the 3rd (Marines) Brigade landed largely unopposed on the Gallipoli peninsula to dismantle Turkish defensive positions. After unsuccessful naval attempts to force the narrows in March, the Turkish army reinforced the peninsula in strength. Thereafter, a major amphibious operation was needed. The Plymouth Battalion RMLI participated in the initial landing on April 25, but the brigade did not land until the night of April 28/29, when it went ashore at Anzac cove to relieve the 1st and 3rd Australian Brigades. On April 30, it was joined by 1st Royal Navy Brigade, which contained the Deal RMLI battalion. For the following fortnight, both brigades were engaged in continuous heavy fighting against the Turks. After a counter-attack in the Monash Valley by Chatham and Portsmouth Battalions on May 3, 1915 – the day of Private Mills’ death – the Turks were driven back with heavy losses. Thomas Mills was a member of Ebrington Presbyterian Church, Londonderry, and the Murray Parent Club of Apprentice Boys of Derry. His father, Alexander – who possibly died on March 27, 1931 – and mother, Margaret, resided at 6, Orchard Row, Londonderry. Being unionists both signed the 1912 Ulster Solemn League and Covenant pledging resistance to Home Rule for Ireland. A brother of Thomas, Robert, appears to have been stationed for a time with the Ulster Special Constabulary, Claudy, County Londonderry, and a sister, Edith, lived in Canada. Private Mills joined up shortly before the declaration of the Great War, being then engaged as an apprentice cutter in the factory of Messrs Lowry & Porter – possibly shirt manufacturers, Bishop Street. He formed part of the landing operations at the Dardanelles. His father served with the 1st Inniskillings through the South African War, and held the King’s Medal, with two clasps, the Queen’s Medal, with five clasps, and the Distinguished Service Medal. Thomas Mills’ mother, Margaret, was fatally shot on Wednesday, June 23, 1920 – one of twenty people who lost their lives in Londonderry during a week of sectarian violence in the city. At the opening of the inquest into her death, on Friday, June 25, evidence of identification was given by the husband. The Coroner, John P. Thompson, J.P., expressed sympathy, on behalf of himself and the jurors, with Mr Mills and relatives of the deceased. It seemed to him, from the investigations he had made, that it was the innocent, to a great extent, that were suffering. On Tuesday, July 6, 1920, in the Police Court, J.P. Thompson, J.P., deputy coroner, resumed the inquest into the death of Mrs Mills. Albert Duff, 39, Ferguson Street, stated that on the evening of June 23, he heard a shot, and soon afterwards saw Mrs Mills coming down Ferguson Street with her right hand over her left shoulder. When she had walked about thirty yards Duff noticed some man rush to catch her as she was falling. Duff had her brought into his house, where she died in five minutes. She was unconscious all the time. Duff added that there was almost continuous shooting all that day in Bishop Street. Thomas Davis, Ferguson Street, gave evidence of a similar character. Mrs Mills, he said, was sinking on the street when he got hold of her. Davis did not see who fired the shot. The Coroner – Have you any idea where the shot came from? Davis – It must have come from the foot of Bishop Street, judging from the position the woman was in and the nature of her wound. A Juror – Could the shot have come from the Waterside? That would be impossible, it was answered. The woman was facing down Bishop Street, and got the wound in the breast. Charles Hegarty, Ferguson Street, said he saw Mrs Mills walking up Ferguson Street in the direction of Bishop Street. 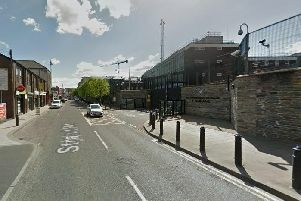 Hegarty was also of the opinion that the shot came up Bishop Street. In reply to the same juror – a Mr Hutchinson – Hegarty said it would have been impossible for the shot to come from the Waterside and hit her in such a position. Mr Hutchinson suggested it would be necessary to get a map to show whether it was possible. The Coroner – We will have no maps. We are here to find out the cause of death, and it is for another tribunal to ascertain other details. The evidence of a Dr Crosbie was that death was due to shock and haemorrhage, caused by a rifle bullet wound on the chest. The jury returned a verdict of murder against some person or persons unknown. They extended their sincere sympathy to the husband and family of Mrs Mills. Frederick Slater, 1st Hampshire Regiment, was born at Swindon, Wiltshire, and died in hospital on May 3, 1915, from wounds received at the Second Battle of Ypres, on April 30. He was a member of Ebrington Presbyterian Church, and husband of Elizabeth Slater, Fountain Street and 9, Pitt Street, Londonderry. His remains are interred in Bailleul Communal Cemetery Extension, Nord, France, and his name is commemorated on the Diamond War Memorial. 1st Battalion, Hampshire Regiment, were in Colchester with 11th Brigade, 4th Division, when war broke out in August 1914. This Division was held back from the original British Expeditionary Force by a last minute decision to defend England against a possible German landing. The fate of the BEF in France and the lack of any move by the Germans to cross the channel, reversed this decision and the 1st Hampshires moved to Harrow to prepare to proceed to France. They landed at Le Havre on August 23, 1914, arriving in time to provide infantry reinforcements at the Battle of Le Cateau – the Divisional Artillery, Engineers, Field Ambulances and mounted troops being still en-route at this time. They were in action at the The Battle of the Marne, The Battle of the Aisne and at The Battle of Messines in 1914. In 1915 they fought in The Second Battle of Ypres. On April 24, 1915, the 1st Hampshire Regiment left Bailleul by train at midday. They reached Poperinghe about 3.15 pm, and from there marched to Basse Boom where they were billeted for the night, according to Hicks in some farms. At 6 am the next day, the Battalion marched to Vlamertinghe. There they remained until 6.30 pm, when the 11th Brigade was ordered to relieve the Canadians at Zonnebeke. The Battalion reached Wieltje at about 9 pm, where they were to be met by guides from the Canadian Brigade. However, after waiting for more than an hour, the Canadian Brigadier had arrived, but no guides. Brigadier-General Haslar, commanding the 11th Brigade, ordered the Hampshires up to occupy a line to the right of the 85th Brigade. The 85th Brigade was severely stretched and had gaps in its line. Furthermore, the Brigade’s left flank was open. There was very little information about which trenches the Germans had captured. With only a couple of hours left before daybreak a hasty reconnaissance was made, and the Battalion began to dig itself in. Fortunately, there was a thick fog at dawn, which gave an extra hour digging before the men were exposed to the view of the enemy. Heavy shelling began at midday, followed by German advances. The position proved to be a strong one, and prevented the Germans getting round the flank of the 85th Brigade. The Hampshires were however heavily enfiladed from both flanks. At the extreme point in the Ypres Salient and overlooked on three sides by the enemy, who also had the advantage of high ground, the Hampshire’s position was not an enviable one. On the left A Company, under Captain Sandeman, had occupied some houses. A surprise attack caused some confusion and Sandeman was killed, before a local counter-attack secured the situation. By nightfall the Battalion had lost 4 officers and 50 men killed. 2 officers and 98 men were wounded. 9 men were missing. These losses were incredibly light given the weight of fire the Battalion was under. At one stage Battalion Headquarters had a very lucky escape, when the C.O., Adjutant and 3 orderlies were buried by a shell which pitched just into the side of the parapet. During the night of April 26/27, the trenches were extended and improved. The situation was obviously still fairly chaotic, as the Battalion learnt during the night that the Rifle Brigade were about 1.5 miles to their left and rear, leaving a large gap. Although the war diary states that April 27 was a fairly quiet day, 1 officer and 16 men were killed, 1 officer and 28 men wounded, and 2 men missing. On April 28, the Commanding Officer, Lieutenant-Colonel Hicks, was called away to take over command of 11 Brigade after Brigadier-General Haslar was killed. Major Palk took over command of the Battalion. By April 29, the front was firming up. The Hampshires made contact with the Rifle Brigade on their left and the Buffs on the right, forming a continuous front line. April 30 – the day of Corporal Frederick Slater’s death – saw a counter-attack by the French to the north, but little progress was made. The Battalion Headquarters was heavily shelled. Also on the same day Colonel Hicks returned to command the Battalion. Corporal Slater had accompanied the Expeditionary Force to France in August 1914. He was previously employed with Messrs. Miller & Beatty, Londonderry.